Palamós is one of our favorite Costa Brava towns and after several visits we decided to put together a travel guide to help other travelers discover all the wonderful things to do in Palamós Spain. 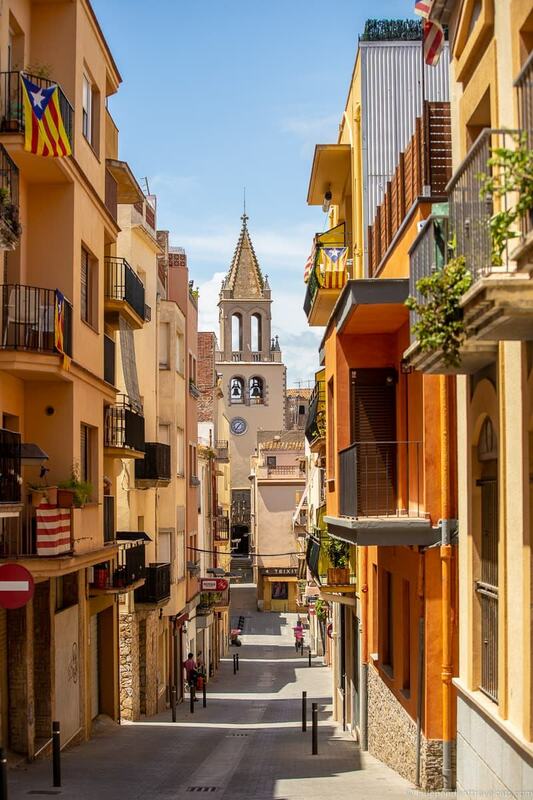 This Mediterranean coastal town is one of the best preserved fishing villages in the Costa Brava and is a perfect place to relax and learn about the local Catalan culture. The town offers scenic hiking paths, several beaches, water sports, historical attractions, and an excellent fishing museum. It is also well known for its fresh seafood, cooking workshops, and famous Palamós gambas. If you enjoy seafood, this is the town to visit! There are plenty of things do in Palamós and you can easily spend a couple of days here. The town also makes for a great day trip from Barcelona or Girona as it is well located within Catalonia. Whether you have 1 hour or 1 week here, we’ll provide advice on how to get to Palamós, where to stay, what to eat, and what to do in Palamós. Best Time of Year to Visit Palamós? Where to Find More Information on Palamós? Before we begin with all the attractions, here is some travel information that may come in handy. This includes advice and tips about getting to Palamós, getting around Palamós, where to stay in Palamós, and when is the best time of year to visit. Palamós is located in the northeastern tip of Spain, within the province of Girona. It is within the Baix Empordà comarca of Catalonia and the area known as the Costa Brava. It is located about 60 miles northeast of Barcelona. It is a coastal city located along the Mediterranean Sea. There are several ways to get to Palamos but the only direct way is by car, bus, or taxi. By Plane. There is no airport in Palamós, but the closest airports are Barcelona Airport (1.5 hour drive away) and Girona Airport (40 minutes away). By Train. Palamós does not have a train station. 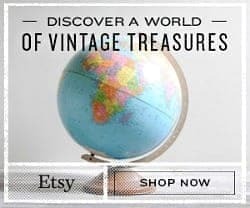 But if you are traveling by train from elsewhere in Spain or Europe, the nearest train stations are in Caldes de Malavella, Girona, and Barcelona. From the train stations, you can get a bus or taxi to Palamós. You can check train connections on the RENFE website. By Bus. If are traveling by bus or need a bus connection, there are regular connections to Palamós from Girona, Barcelona, Barcelona airport, Lloret de Mar, Caldes de Malavella, Palafrugell, and many towns along the Costa Brava. Bus services in the area are through Moventis Sarfa, and you can check here for bus connections and prices. By Car. For drivers, Palamós is located about 20 miles from Girona (32 km, about a 35 minute drive), 72 miles from Barcelona (115 km, 1 hour, 30 minute drive), 75 miles from Perpignan, France (120 km, 1 hour 30 minutes), and 450 miles from Madrid (724 km, 6 hours, 30 minutes). By Tour. There are a few guided day tours available that leave from Barcelona or Girona and visit Palamós. These are good options if you don’t have a car and don’t want to take the bus. See Day Tours section below. If you want someone else to do the driving, you can join a guided day tour to Palamós. Tours are possible from both Barcelona and Girona. This full day tour from Barcelona focuses on the beaches and fishing villages of the Costa Brava and includes a stop in Palamós. This tour of Palamos from Girona includes a short coastal walk to one of the coves of Palamós, a visit to the Museu de la Pesca, a show cooking demonstration, and a seafood meal with wine. 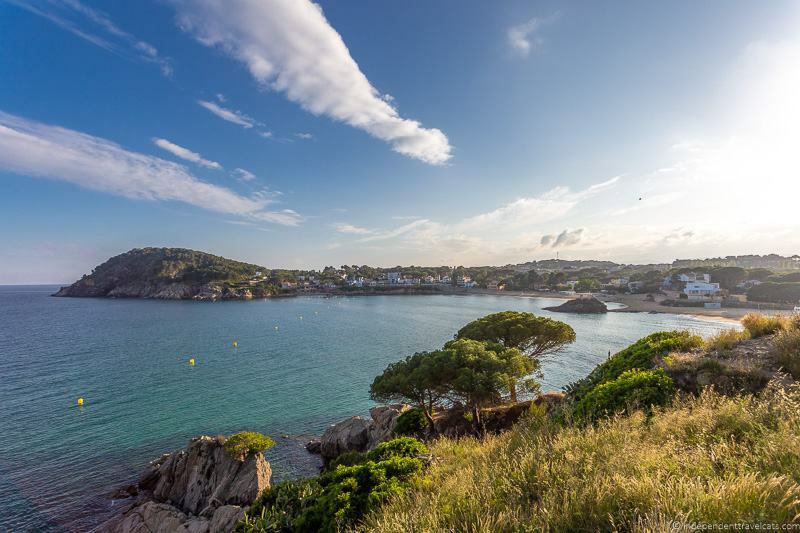 If you enjoy hiking, this full day hiking tour with hotel pick-up in Barcelona includes 5 hours of hiking and gives you time to see all the coastal highlights of Palamós. This private food focused tour from Barcelona includes a drive along the city’s coast, a visit, tasting, and meal at a local winery and farmhouse, and a visit to the medieval town of Pals. Many of the attractions within Palamós are within or a relatively short walking distance from the city center, including the Old Town, Platja de Gran, port area, and Museu de la Pesca. However, the town is spread out so it is a much longer walk to get to attractions outside the city center such as the Bell-lloc area and some of the town’s coastal coves and beaches. These are best explored by hiking, but you can also drive to some of them or take a taxi. In the summer, there is the Badia bus that stops at many of the tourist attractions in Palamós and the surrounding area. 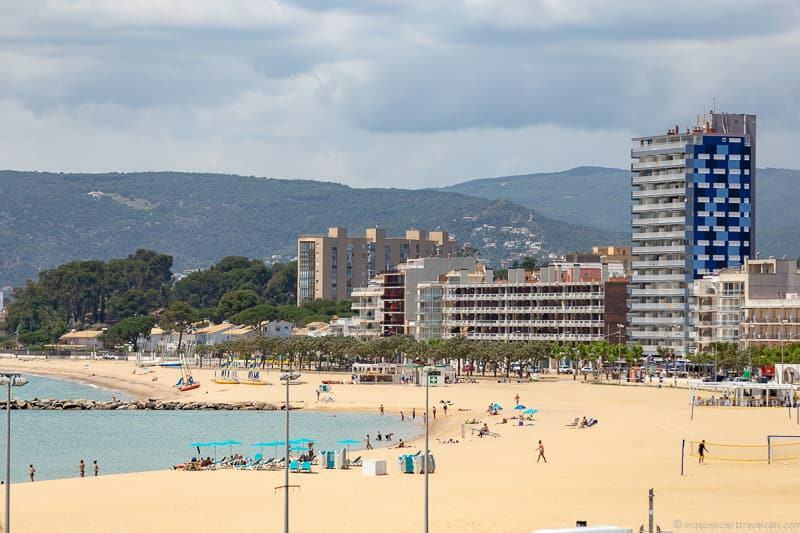 If you want to explore some of the nearby towns, Palamós is fairly well-connected to many other Costa Brava towns through the Moventis Sarfa bus services. You should be able to reach almost any other town in the area by bus. The most popular time to visit is during the summer months as the warm weather makes it a perfect time to enjoy water activities and relax on the beach. However, if you want to visit during a less crowded time, we also recommend the late Spring or early Autumn. The Spring and Fall are great times to visit for hiking or cycling without the hot weather. But any time of the year can be a good time to visit, depending on what you want to do. There are events and festivals held year-round in Palamós. If you are staying overnight in Palamós, we’d recommend staying within walking distance of the city center of Palamós to maximize your time and be close to the beaches, restaurants, and attractions. However, if you are traveling with a car and looking for something different, there are also some amazing country house hotels and B&Bs located just outside the city center. There is a wide variety of accommodation options in Palamós that should suit any type of traveler. We provide some recommendations below that range from budget to luxury, but you can also check out a full list of options here. These lodging options are all centrally located and within a 5 minute walk of the Platja de Gran and within a 10 minute walk of the Museu de la Pesca and port area. Hotel Trias – This well-rated beachfront hotel offers sea views, a pool, and a restaurant. It is the kind of hotel many people imagine in the Costa Brava and is well worth a look. Truman Capote once stayed here. Centrally located, a 1 minute walk to Platja de Gran. Hotel Marina – This centrally located hotel offers basic good value rooms. The hotel has a restaurant and bar and is located only a 3 minute walk from the Platja de Gran. Hotel Casa Vincke – This centrally located beautiful boutique B&B is set within the beautiful historical Casa Vincke. The renovated former home offers comfortable contemporary decor mixed with original architectural elements. A few minute walk to the main beach. Pal Apartments – Well-rated basic apartments centrally located in Palamós, only a 5 minute walk to the main beach. A good option for travelers on a budget and families looking for a well-located self-catering option. Apartamentos la Catifa – These well-rated apartments are located near the main beach and many apartments offer views over the marina. A 3 minute walk to Plajta de Gran and easy access to coastal hiking paths. Located near the fish market, you can easily buy fresh fish and cook your own seafood dishes here! These lodging options are outside the city center but still in Palamós (except for the hostel in Palafrugell) and within a 10 minute drive of the city center and Platja de Gran. Finca Bell-lloc – If you are looking for a quiet place away from the town and have a car, we recommend taking a look at this country house inn set in a beautiful wooded area just outside the city center. It has a restaurant and is next door is a winery. Perfect setting for wine lovers and hikers. 5 minute drive to Palamós city center and beaches. Hotel La Malcontenta – This 19th century grand country house hotel is our pick for those looking for a bit of luxury and have a car. Offers a swimming pool, restaurant, and bar in a quiet location. Located 8 minute drive from city center, 7 minutes from Platja Castell, and 10 minutes for Platja de Gran. Alberg Solidança – A hostel in nearby Palafrugell offering dormitory style accommodation along with a barbecue area and children’s playground. This is our recommendation for those on a tighter budget. It is a 17 minute drive from the Palamós city center and Platja de Gran. 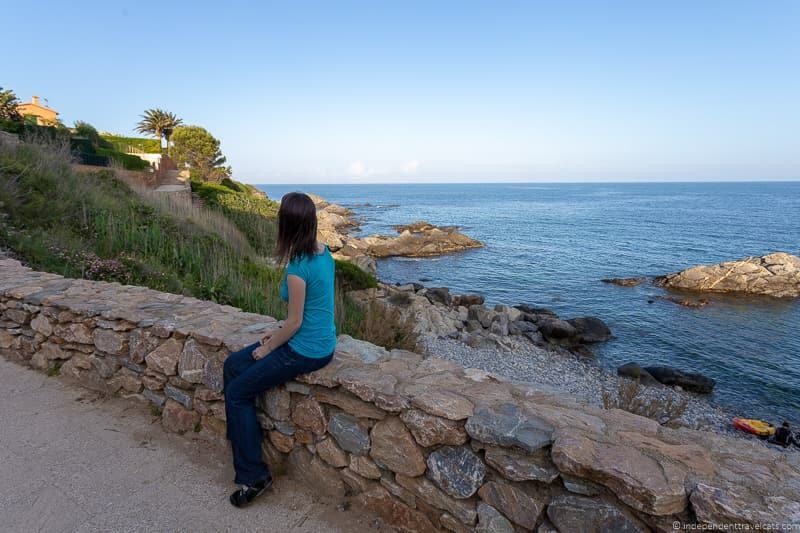 If you don’t have a car, you can reach Palamós by local bus, bike, or hiking. For those wanting to camp in either a campervan, RV, or tent, there are several campsites in the area. Most campsites in the area are open seasonally between March and September. 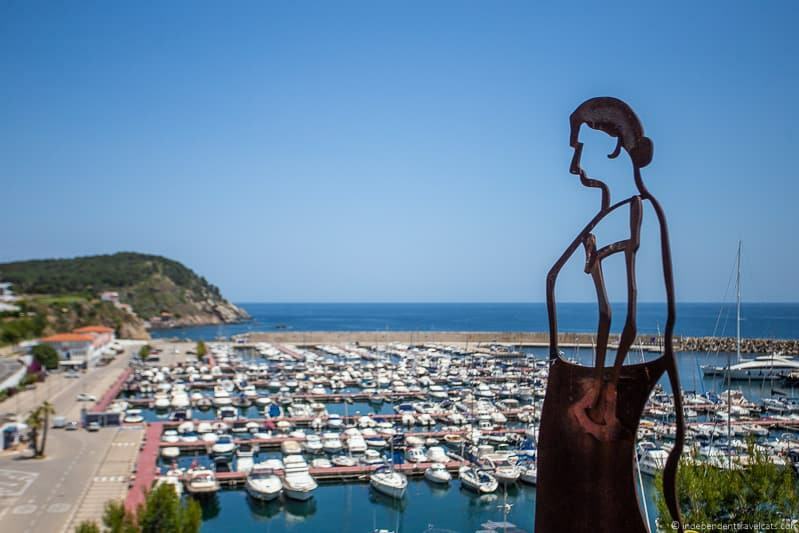 If you are still looking for information after reading this post, we recommend checking out the official tourism website for Palamós and the tourism website for the Costa Brava region. Both websites offers loads of information. Once you are in Palamós, we recommend stopping at the Palamós Tourist Information Office (Address: C. Passeig del Mar, 17230 Palamós). You can also call the tourist office at (+34) 972 600 550. There is also tourist information available within the reception area of the Museu de la Pesca. There are plenty of things to do in Palamós Spain, and you can easily spend a few days exploring the beaches, historical sites, museums, and hiking routes. Although many people only see the beaches and fishing museum, there is plenty more to do this little coastal town if you have the time. Like most coastal towns along the Costa Brava, you’ll find rocky coastline along with sandy beaches in Palamós. Swimming or relaxing on the beach is a perfect way to spend an afternoon. There are several beaches to choose from, so you can even go beach hopping if you wish. The largest beach, Platja Gran, is a long sandy beach that is well-integrated into the town. It is located a short walk from the town center, tourist information office, and Museu de la Pesca. There is parking here located off Passeig del Mar as well as chemical toilets, showers, accessible paths, and various services (beach umbrella rentals, kayak rentals, boat excursions). A number of restaurants and hotels are located along or near the beach. This city beach offers the most services and is the most centrally located. Platja de la Fosca is another beautiful sandy beach in Palamós. It is located on the other side of the port as the Plaja Gran. It is about a 20 minute walk or 5 minute drive from the city center. This beach is often the favorite for families with younger children as the water doesn’t get deep until fairly far out so lots of shallow area for young children to enjoy. The beach has showers, accessibility ramps, and lifeguard services. A number of cafés and hotels are located near the beach. This beach is a great family-friendly option with its shallow waters and feels like more of an escape than Platja Gran as it is further from the city center. Platja Castell is a pretty sandy beach on the outskirts of Palamós. In the summer, there is a small café and kayak rental services on the beach. You can also visit the ruins of an Iberian settlement of Castell just above the beach or the Barraca d’en Dalí located in the forest area. You can drive and park near the beach and it is a short walk from the parking area, or you can hike here along the coastal path from central Palamós. This is the least developed of the three main beaches and feels a bit more natural. This is probably our favorite beach in Palamós, but it is further away from the city center and offers fewer services than the other two. There are more beaches in and near Palamós including Platja del Morr del Vedell and Platja des Monestri. There are also several smaller coves, which have small sandy or rocky beaches such as Cala Margarida, Cala Estreta, and Cala S’Alguer. Many of the coves require short hikes to reach. A coastal path links the various beaches and coves together and is a great way to mix a bit of hiking with some beach time. See Hiking section for more information on these paths. Palamós was officially founded in 1279 by King Pere II and was tasked with defending its royal port. For centuries, pirate raids and military conflicts would trouble the town, slowing its growth. Most villagers lived within the town walls for protection and it is here that you’ll find the Old Town area. The area is best explored on foot and we’d suggest starting the walk by stopping at the Tourist Office on Passeig de Mar. Here you can get a walking map of the town. From the tourism office it is a short walk to a set of stairs that brings you to the Mirador de la Plaça de la Murada, a nice viewpoint over the town. In the square you’ll find a seated statue of Ezequiel Torroella i Mató, a painter born in Palamós. Then onto the Parròquia de Santa Maria del Mar, a church originally completed in 1441, built on the site of a smaller 14th century chapel. This is the oldest active building in Palamós. The Roman Catholic church was expanded, damaged, and rebuilt over the years, but original architectural elements still remain from the late Gothic and Baroque periods. One of the treasures of the church is its beautiful late 16th century altarpiece which includes paintings by Dutch painter Isaac Hermes Vermey. You can then continue to explore the Old Town, using either the walking map from the tourism office or just wandering around the narrow streets on your own. 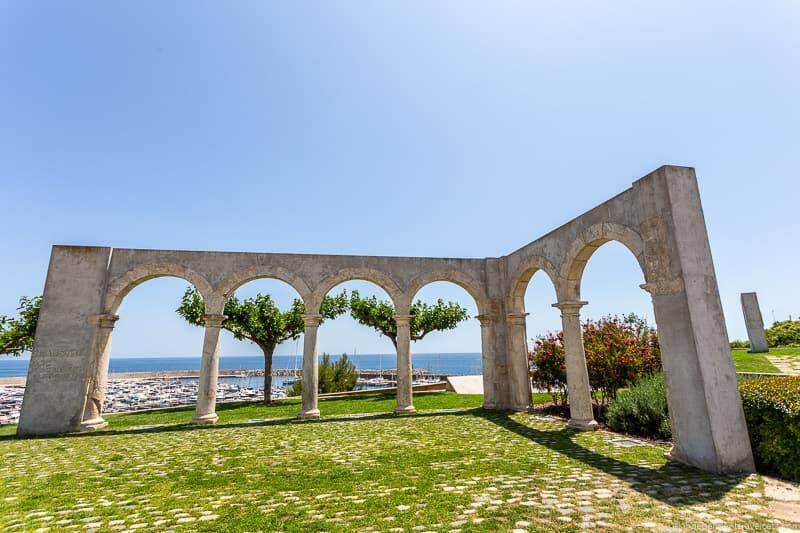 Some of the other historical highlights include the Capella del Carme (an 18th century Roman Catholic hospital church turned into an art and cultural space) and the remains of a former Augustine convent (later used as a cork factory known as “El Convento”). As you walk around, there are information placards around the town center that provide information on historical buildings, squares, cultural activities, and former businesses in several languages. These are worth stopping to read to learn more about the town. Within the Old Town you’ll also find several cafés, restaurants, bars, and shops. On a nice day the outdoor seating on the little squares are great places to enjoy a coffee, glass of wine, or light meal. If you enjoy water activities and water sports, there are loads of opportunities to get out on the water in or near Palamós, especially in the summer months. These include swimming, waterskiing, scuba diving, kayaking, sailing, jet skiing, surfing, fishing, and boat rides. Whether you are looking for a family day swimming at the beach, an afternoon of jet skiing, or a day of sailing, you’ll be sure to find something that will appeal. If you are wanting to learn a new skill, Palamós offers opportunities to take surfing, sailing, or diving lessons. The area is very popular for sailing as wind conditions are often ideal. Divers may want to explore the nearby Boreas Pellworm shipwreck, a former Germany Navy tugboat used during WWII. Boat rides vary from short leisure sightseeing cruises to all day fishing trips, and you can even rent your own boat (with our without a captain). Those who really want to learn about the local fishing culture should consider the unique opportunity to spend a full day about an active fishing trawler. These fishing boat trips need be arranged in advance with the Museu de la Pesca. Experiencing the coastline from a boat is a fantastic way to see the rugged cliffs, coves, and beaches. If you want to combine a scenic cruise along the beautiful Costa Brava coastline and a fresh seafood dinner of the famous Palamós prawns, consider this 5 hour cruise trip from the Palamós port. 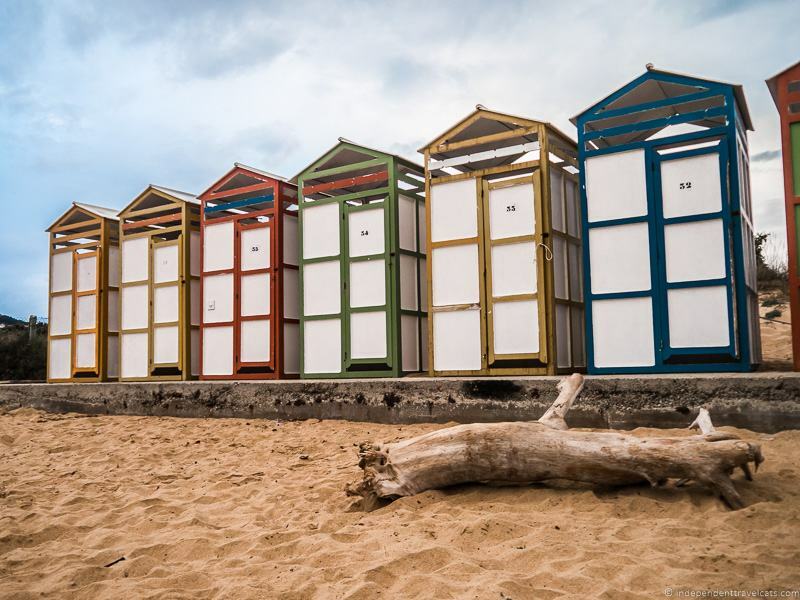 Check out these listings to find a current list of the local companies who offer water activities, services, and rentals in Palamós. Although we recommend booking activities in advance, you can also find kiosks along the Platja Gran offering a number of services and rentals. There are a number of hiking paths you can take in and around Palamós, whether you are looking for a short walk or a full day hike. Most hiking trails in the area are easy to medium in difficultly level, and are suitable for hikers of most experience levels. If you are new to hiking in the region, I’d stop into the tourist information office for a map and the latest trail information and suggestions. For those with reduced physical mobility or who are in a wheelchair, the tourist office can let you know about local accessible paths. If you are looking for a guided hike, you can check out this tour that includes a few hours of hiking with a guide along the coastal path, a beach stop for an optional swim, lunch with wine, and a transfer back to Palamós. 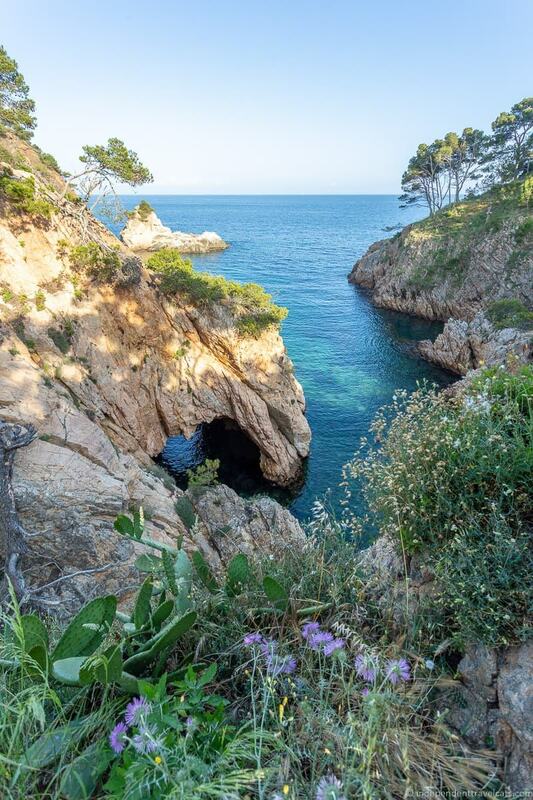 The most popular hiking path in Palamós is its coastal path where you can see the rugged coastline, beaches, hidden coves, scenic viewpoints, and archaeological sites. You can head either direction on the coastal path and you can go as far as you like as the path goes all the way to Blanes in the south and into France in the north! So the length, direction, and route of your hike are really up to you. 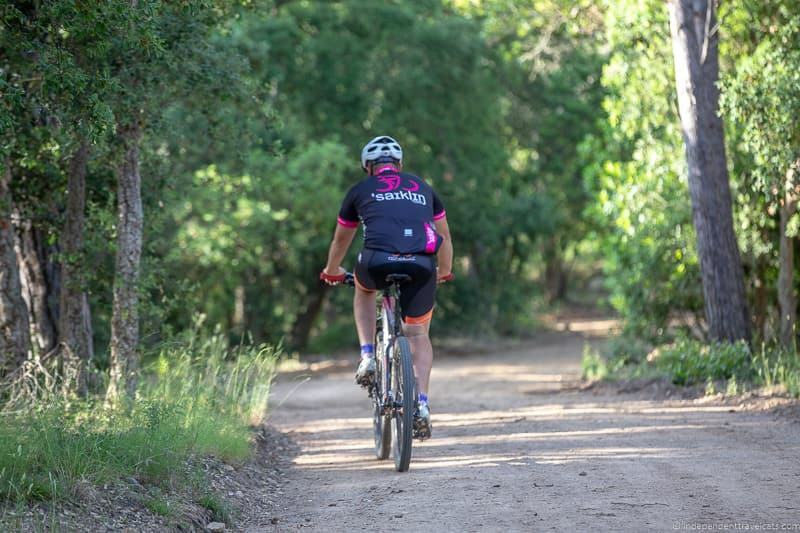 If you’d rather get around by bike than on foot, you can cycle along the Ruta del Tren Petit as it is both a hiking and cycle trail. Our favorite coastal hike here is to head northeast towards Calella de Palafrugell. A common starting point for the hike is the marina near Cala Margarida but you can start from anywhere in Palamós (e.g., Plajta de Gran). This is a beautiful hike, especially on a sunny day, and you’ll go past beautiful coves, beaches, the old fishermen’s huts of Cala S’Alguer, the ruins of Sant Esteve de Mar Castle, and the Iberian settlement of Castell. You can choose how far you want to go, some suggested stopping points are Platja de la Fosca, Platja de Castell, Jardins de Cap Roig, or continue all the way to Calella de Palafrugell. The total hike from Cala Margarida to Calella de Palafrugell is about 6.6 miles (10.6km) and it takes about 4 hours each way or 8 hours round trip. The hike to Platja de Castell is about 2.8 miles (4.5 km) and it is about 6.6 miles (10.6 km) to Calella de Palafrugell. To get an idea of how long it takes, it is about a 1 hour 30 minute hike from Palamos to Platja de Castell (about 4.5 km), and then 2 hours and 30 minutes from Platja de Castell to Calella de Palafrugell. So a round trip hike from Cala Margarida to Platja de Castell will take you about 3 hours. A good family-friendly hike is to start in Platja de la Fosca and then hike to Platja de Castell with plenty of beach time in between. The walk takes about 1 hour at a leisurely pace or 2 hours round trip. If you’d rather hike the other direction, we can also recommend the coastal hike to Platja d’Aro (coastal town with a beach) which also passes through beautiful beaches, coves, and stunning viewpoints. These include (in order from Palamos): Sant Antoni de Calonge, Torre Valentina, Cape de Roques Planes, Cap Rog, Platja de Belladonna, and Sa Cova. Platja d’Aro has a number of restaurants and cafes, so a great place to relax for a meal or coffee before heading back. This hike is about 5.2 miles (8.5km) and takes about 2.5 hours to reach Platja d’Aro. So the full round trip is about 10.4 miles (17km) and takes about 5 hours. Palamós may be best known as a fishing village and coastal town, but you’ll also find that it is surrounded by mountains and forest to the north. This area of the Gavarres Mountains hides ancient ruins, a ruined castle, mountain landscapes, and a church sanctuary. Along the Vall de Bell-lloc (the Valley of Bell-lloc) hike you can also see the cork oak trees here which is the tree from which natural wine corks are made, once a major industry in Palamós. There are also vineyards and olive trees. There are a variety of hiking paths here but we suggest you park your car at the playground across from Can Peretià (GPS: 41°52’25.944″ N 3°7’12.575″ E ) and then head towards Santa Maria de Bell-lloc (current building dates mainly to 18th century although a hermitage has been here since the 13th century) and the ruins of Castell de Vila-romà and then continue along to follow a circular path. Along the path you can stop to see ruined old stone huts, mills, scenic views, and the Montagut dolmens (single-chamber megalithic tombs). The round-trip hike is about 3.5 miles (5.7km) and takes about 2 hours to include the sanctuary, castle ruins, and mountain sites. But it can easily be shortened or lengthened depending on the time you have. Before or after your hike, you may want to have a meal or do a wine tasting at Finca Bell-lloc or Celler Brugarol winery (both are located nearby and owned by the winery). Visits, meals, and tastings must be arranged in advance. Another hiking option is the Via Verda (“Green Route”) or Tren Petit (“Small Train”) hiking trail that links Palamós with Palafrugell. 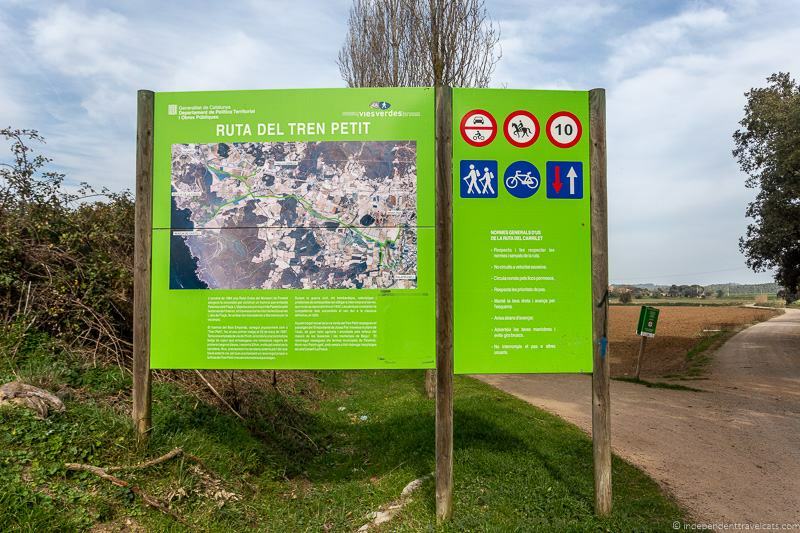 The trail follows the route of an old “petit train” that once ran from Palamós to Girona, passing through Bisbal d’Empordà. 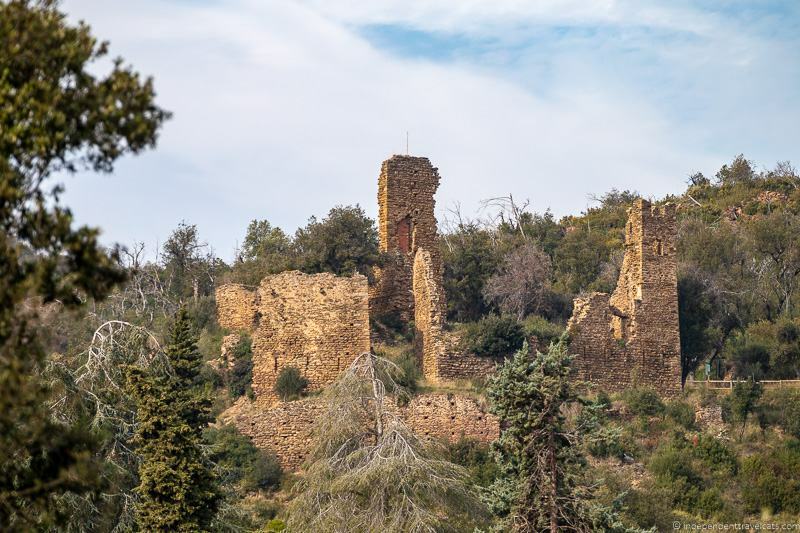 You can follow the old rail line to the town of Palafrugell, or you can take a number of connecting paths to visit Vall-llòbrega and to the beaches of Platja de Castell and Platja de la Fosca. The main section of the route going directly to Palafrugell is about 4.3 miles (7 km) long and takes about 2 hours, or 4 hours round trip. But you can make it longer or shorter by taking the connecting paths and trails. For instance the section to Platja Castell is an additional 1 km. If you want to do a hike and include all the main connecting paths, the hike would be about 10.5 miles (17km) and takes about 4 hours or 8 hours round trip. There is a cycle path as well and the main route can also be done by bike and it connects to other cycle paths in the area which is what Laurence did several years ago. You’ll find the sign for the beginning (the official end actually) of the marked path near a gas station in the Sant Joan neighborhood of Palamós (GPS coordinates: 41°51’52.7″N, 3°08’12.9″E). You can start here or you could start on the other end in Palafrugell. Looking for a longer hike? 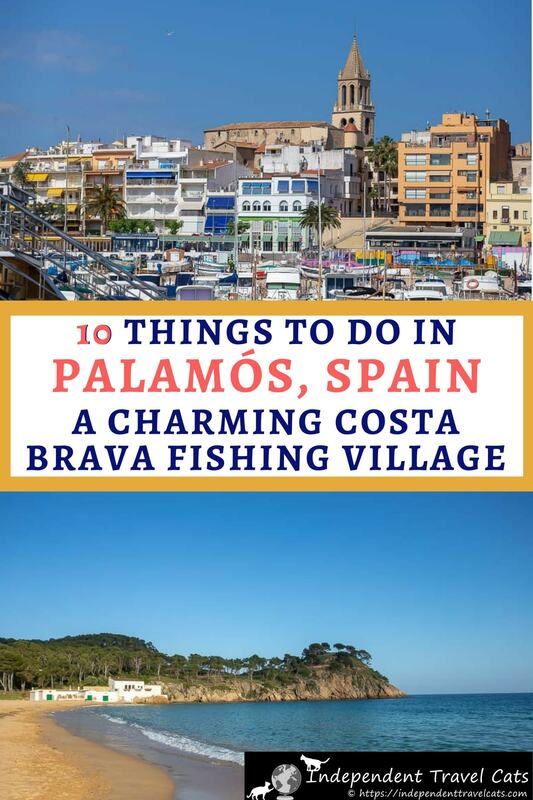 Palamós is a stop along the GR-92, Camino de Ronda (Camí de Ronda in Catalan), and the Costa Brava Way and is a great place to start or include in a longer multi-day hiking adventure in the Costa Brava. The popular Costa Brava Way hike is the 255 km (158 miles) route from Blanes, Spain to Collioure, France that has many coastal hugging sections. The full route takes about 2 weeks but you can choose to do any section of it. If you are planning on hiking in Costa Brava, we highly recommend The Costa Brava Way guidebook which provides directions, maps, and practical tips for hiking in Costa Brava. This is one of the few good English resources we have found on hiking in this area. 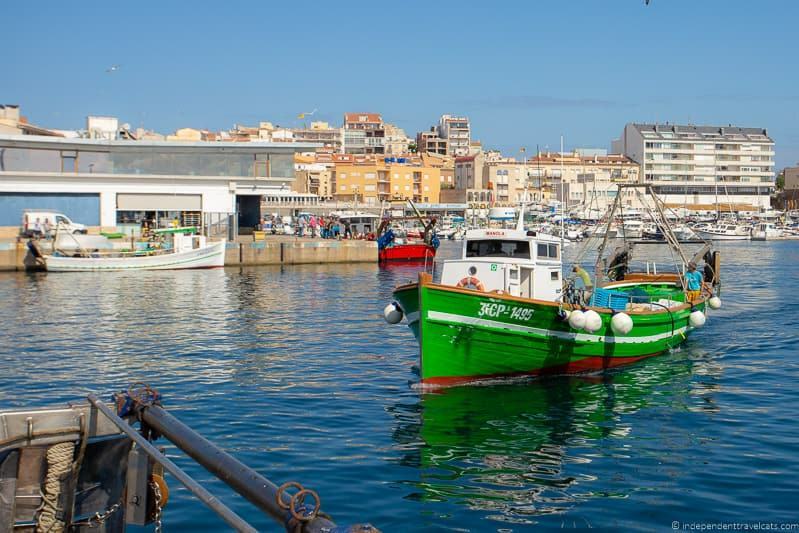 Fishing has long been an important industry in the Costa Brava, and Palamós continues to be one of the primary fishing villages of the region along with Roses, L’Escala, and Blanes. There are a number of ways to enjoy and learn about the fishing culture in Palamós. These include visiting the fishing museum to learn all about the fishing history and current practices, learning how to cook seafood at a cooking workshop, watching a live fish auction, visiting the fish market, taking a boat tour, and eating the local seafood. All of these are located within a short walking distance of each other. We’ll explore all your options below! 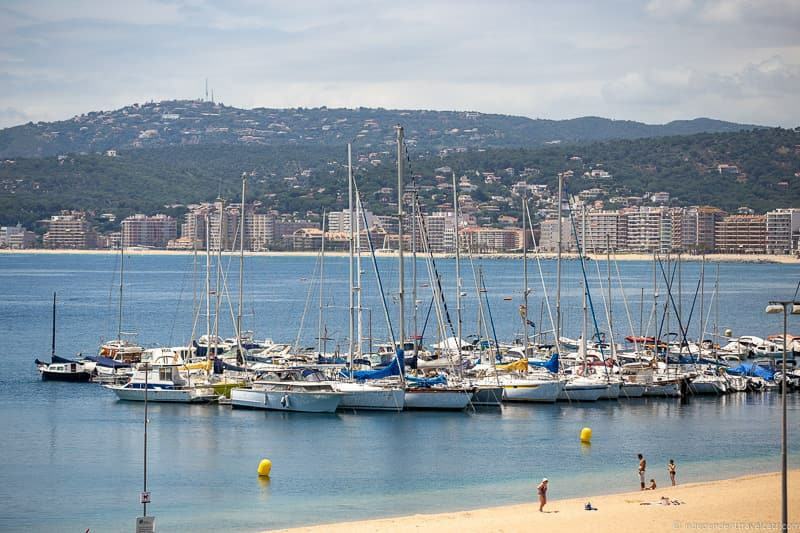 You’ll find the port of Palamós located between the Platja Gran beach and the Palamós lighthouse, and it includes a marina, a harbor, and a commercial sea port. A stroll around the port is a great place to see the fishing boats and fishing crews in action. You’ll also see plenty of shipping boats and pleasure boats. The best time to visit the port to see the fishing boats is early in the morning or late in the afternoon, and you also get a good view from around the lighthouse. If you arrive at the port before 7:00am, you’ll get to see all the fishing boats head out for the day as all of the boats leave at 7:00am from the port. The fishing boats don’t all come back at the same time but they’ll be back in the late afternoon or early evening before the weekday fish auction which starts at 5:00pm. In the late afternoon you can see them unloading their catches for that day and taking them to the market. When wandering around the harbor, watch your step as you wander around as there are potential trip hazards (e.g., ropes, ice, fish, equipment) and be sure to watch children closely. It is free to visit the harbor, just be sure to stay out of the way of the busy fisherpeople and port staff. The Museu de la Pesca (fishing museum) is a museum that details the area’s fishing history, culture, and methods. There is an introductory film and then 2 stories of exhibits on the various aspects of fishing including fishing methods over time, fish preservation, and stories from local fishermen. The museum also has exhibits about the current fishing practices and the future of sustainable fishing in the region. 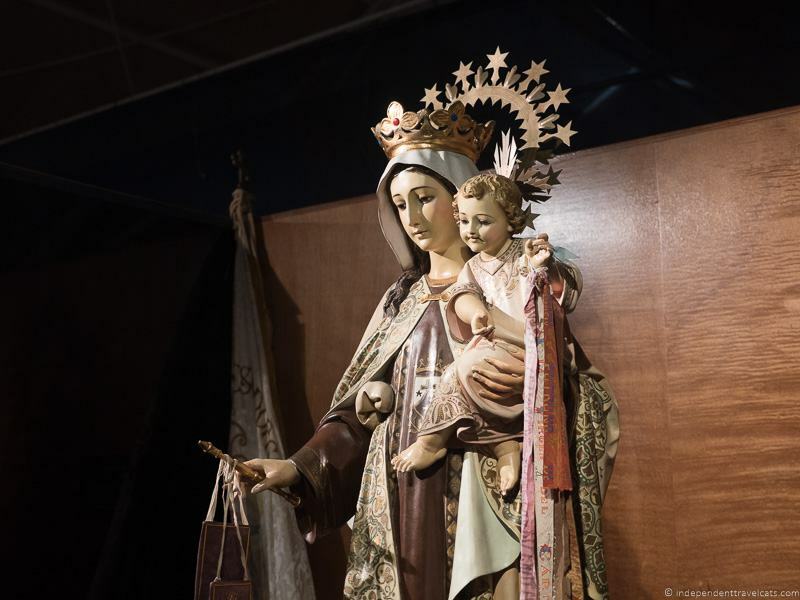 This is the top museum in Palamós and one we can definitely recommend taking the time to visit if you are interested in learning about the martime heritage of Palamós and the Costa Brava region. Visits to the museum are self-guided. If you want a guided tour, it is often possible to book one in advance. Outside the museum also owns a retired fishing boat, La Gacela that can be viewed and toured as well. Just ask inside the museum. Next door to the fishing museum is the Espai del Peix (Fish Space) which offers a series of unique guided tours, workshops, and other activities. These include seafood cooking workshops, nutrition talks, family activities, and demonstration cooking shows. 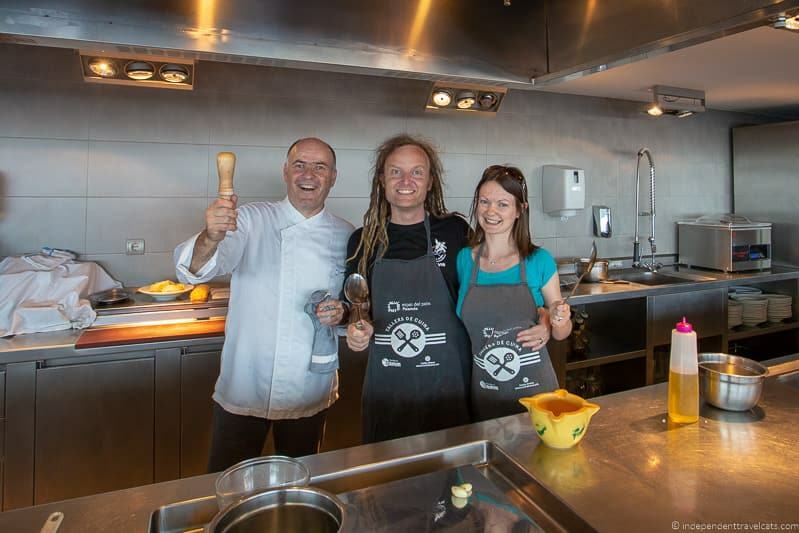 A cooking workshop or demonstration is a great way to both learn how to cook and to sample the local Catalan seafood dishes. 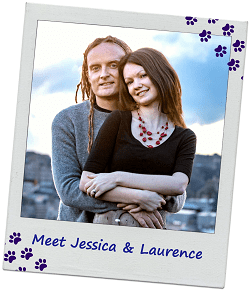 Laurence and I recently had the opportunity to attend a cooking workshop here. We were greeted by Chef Ramon Boquera who is a self-taught chef who worked as a fisherman for 25 years in the area. He cooked almost daily for the fishing boat crews aboard the ship, and so he knows all about the local seafood and how to cook it. Today he and his brother both work as friendly chefs at the Espai del Peix. Chef Boquera greet us and gave us aprons to wear and then told us about the dishes we’d be cooking that afternoon. The cooking workshops and demonstrations have different foci (e.g., medieval cuisine, traditional seafood dishes, shellfish) and can be adapted for groups and those with food allergies. The cooking workshop we did was focused on making traditional seafood dishes. The recipes focused on fishermen style recipes that used fresh local fish. There was also a focus on using lesser known fish species that are often discarded by fishermen and overlooked by homecooks. Our dishes included Atlantic horse mackarel, forkbeard, and the small-spotted catshark. The small-spotted catshark for example is a common fish in these waters but over 90% of those caught are simply discarded and most cooks don’t know how to cook them. Part of the cooking demonstration was to show how to cook lesser known species that are still tasty but are also lower in price and sustainable. The dishes we helped prepare included a fish pickle, a salad, fishermen stew, and rossejat de fideus. The fishermen stew is a very traditional dish and similar to what is often cooked on the fishing boats. The rossejat de fideus, or toasted noodle dish, is a pasta (fideos is a thin short pasta) and seafood dish that can include many types of seafood (e.g., white fish, blue fish, rockfish). This recipe can also be done with rice (arrossejat). You can find some of the recipes used in the workshops and demonstrations online here. As part of this process we learned to make a picada (garlic, nuts, and parsley), which is used in many traditional Catalan recipes as both a seasoning and sauce thickener. We learned about a sofrito, which is a sauce that includes olive oil, tomato, and onion and serves as a base for many Catalan dishes. We also made aioli, alliol in Catalan, which is an oil and garlic sauce typical throughout the Mediterranean. Laurence and I tried our best to be helpful in the kitchen but it was fairly obvious that we don’t cook a lot with seafood! Luckily during the demonstrations, you can help as much or as little as you want. The cooking was fun, but the best part was definitely sitting down to eat what we made. Our seafood dishes were accompanied by fresh bread, local wine, water, and an almond cake. This is a really fun and delicious way to dive into the fishing culture of Palamós. If you are interested in attending a cooking workshop, demonstration, or class during your visit, you’ll need to book in advance. Most of the cooking workshops and demonstrations are in the evening, and include dinner and wine. 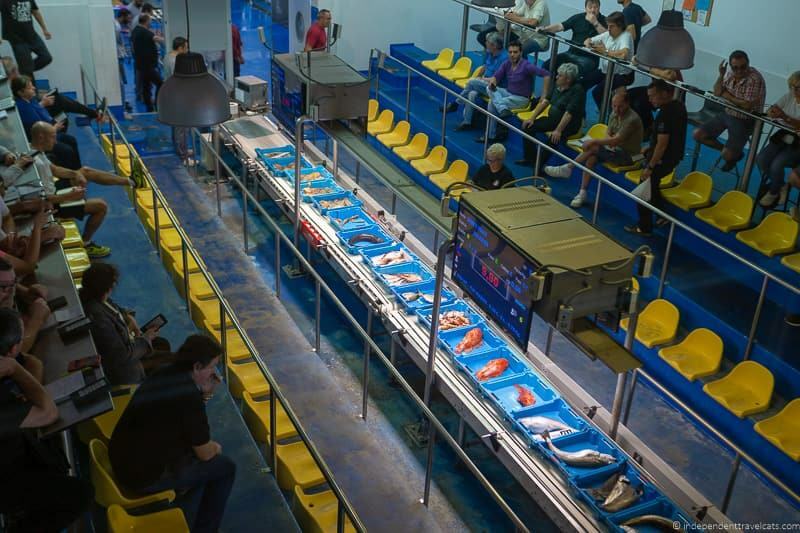 Every weekday there is a live fish auction in Palamós, Visitors have the chance to observe the fish auction from a viewing area behind glass during a guided visit. The guide will explain the process of the auction, the types of fish being sold, and interpret the action happening on the floor. The fish auction is fairly modern with the plastic bins of fresh seafood rolling along and a digital display showing the prices. Bidders, who are typically restaurant owners, fish sellers, or brokers, use a digital device to bid on the fish they are interested in buying. You get a good view from the observation area and get to watch the full process. The fish auction viewing area is located within the Espai del Peix building next door to the Museu de la Pesca and fish market. The fish auction takes places Monday through Friday from 5:00pm to 7:00pm (17:00 to 19:00) although guided visits are not possible every day. You need to book the guided visit in advance or purchase same day tickets from the Museu de la Pesca reception. Every weekday afternoon you can see and buy local seafood at the Fish Market. Most of the fish is fresh off the boats from the Palamós fishermen and caught that day. You can see it being brought over from the auction as the market sellers buy it in the auction and then offer it to the public in the market. The fish market is typically open from 5:00pm to 7:00pm (17:00 to 20:00) Monday through Friday. This is a great place to just see the wide variety of fish and seafood from the area, but also a great place to buy fresh seafood if you are able to cook on your trip. Many sellers are happy to prepare (e.g., descale, skin, gut, cut) the seafood you purchase as needed to be used for cooking. If cooking is not an option during your stay, there are also items like anchovies that you can buy and then eat on toast. In the summer months, there is also the opportunity to actually spend a day on a fishing trawler to learning about fishing and see it up close firsthand! 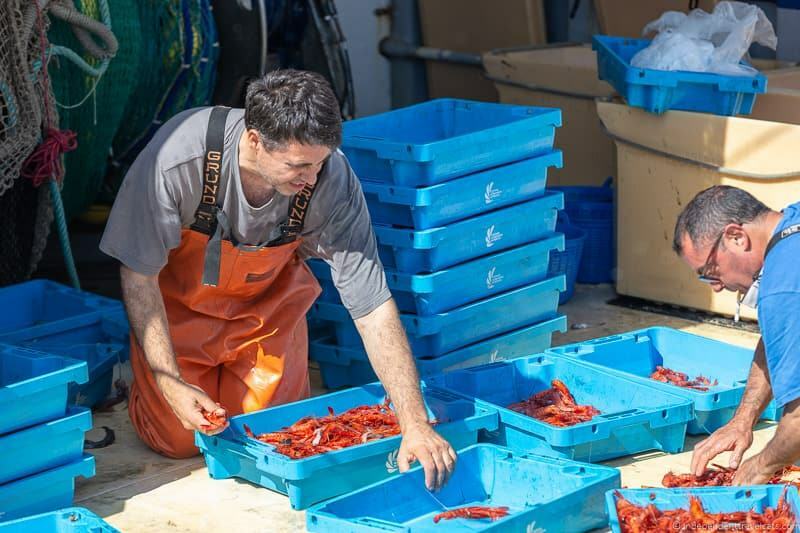 You spend the day aboard a real fishing boat and get to learn about and observe current fishing practices and enjoy time on board with the crew as they work the boat, fish, cook lunch, and bring their catch to shore and then to auction. This is part of the unique pescaturisme offerings of the Fishing Museum. If you are looking for a more relaxing boat trip, consider this 5 hour boat cruise from Palamós that ends with a meal of fresh seafood. Attending a festival or town event is always a great way to get a good sense of the town and its people. Like most towns in Catalonia, Palamós has a number of festivals and events happening throughout the year. These include the Mardi Gras carnival, a traditional boats festival, the Easter Sunday swim, gastronomical events, sardana dance events (a traditional Catalan dance that started in this region), festival of Our Lady Carmen (patron saint of the sea and fishermen), and the town festival on the feast day of Sant Joan (Saint John the Baptist in English) in June. There is also the town’s weekly market every Tuesday morning on Aviguda de Catalunya in Palamós. A great place to find local fresh produce and see the locals out and about. To find out what’s going on during your visit, check out the monthly calendar and this list of annual events. 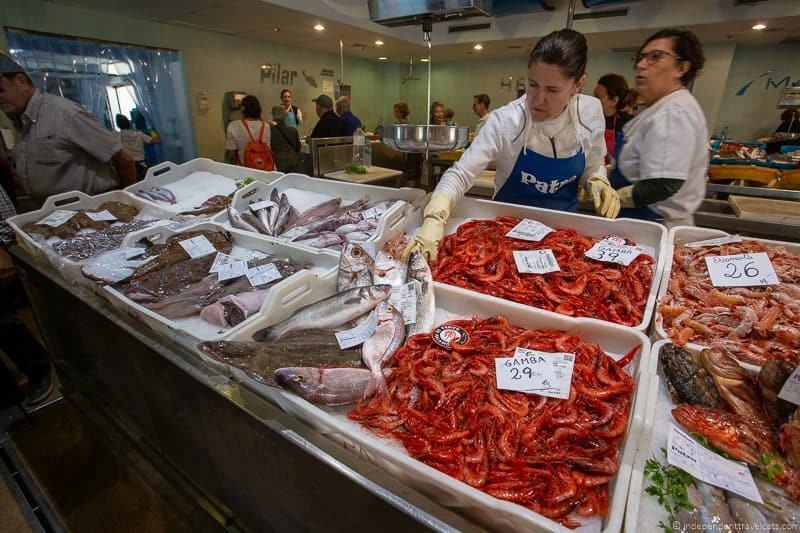 There are hundreds of species of fish that are caught in the waters around Palamós, and it is easy to find fresh fish both in the markets and the restaurants. The best known food in Palamós is the prized red prawns (Aristeus antennatus), known as the “Gamba de Palamós”. These prawns are known for their bright red color and are loved for their firm and succulent meat. You can try the Gamba de Palamós as well as a number of other seafood dishes in a number of local restaurants, such as Can Blau, Restaurante Caleta Blava, La Gamba, Restaurant Hotel Marina, and Mas dels Arcs. If you want to try the local prawns, just be sure that the menu (or staff) clearly state that they are Gamba de Palamós as many places serve other types of prawns and shrimp as well. There are special gastronomic events around the gambas in Palamós and many restaurants offer a special Menú de la Gamba (Prawn Menu) between April and July. Or if you have self-catering lodging, you can purchase fresh seafood from the fish market that takes place each weekday in town and cook your own seafood meal. 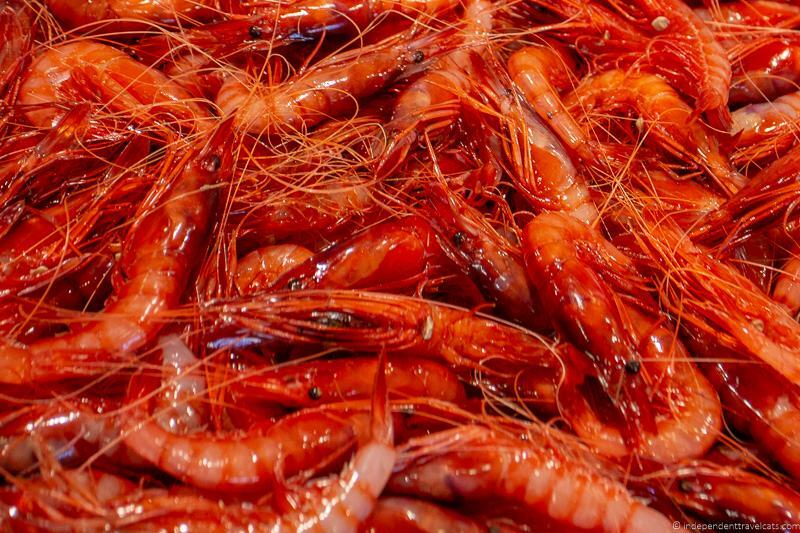 The local prawns have a special protected mark, “Gamba de Palamós Marca de Garantia” (Palamós Prawns Mark of Guarantee), to ensure their origin, freshness, quality, and traceability and you’ll likely see the certificate when buying them from the fish market. If not, you can always ask to see the certificate before purchase. The Costa Brava region is best known for its seafood, but you can find lots of other options in Palamós. There are over 50 restaurants in the city and you should be able to find something that will suit any budget and taste. There are many restaurants serving other Catalan dishes as well as places serving dishes from other regions of Spain and the western Mediterranean region. If you are wanting to cook local dishes for yourself, or want to be able to do so when you get home, you may want to pick up a cookbook. Catalan cuisine goes way back and the first known Catalan cookbook, Llibre de Sent Sovi, or The Book of Sent Sovi in English, dates back to 1324 and is one of the oldest surviving culinary manuscripts in the world! However, you’ll probably want a more modern cookbook, and you can find them in local shops or check out a list of options online. 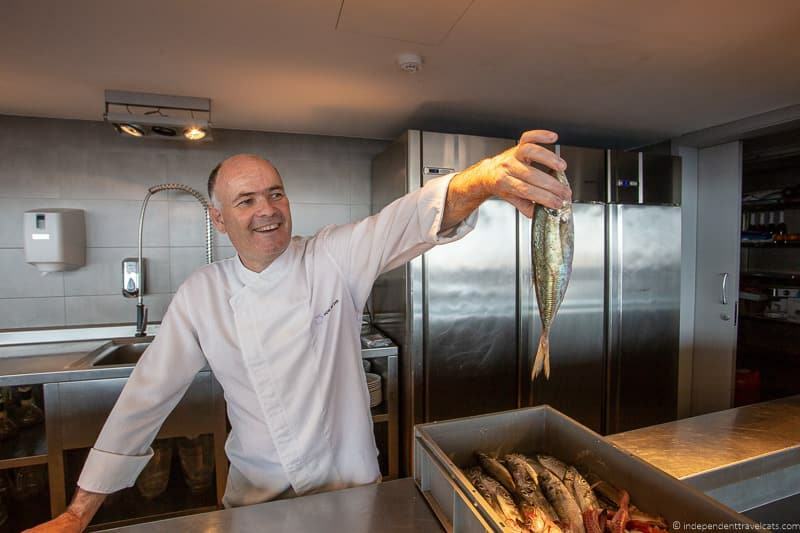 If you are staying in Girona and are interested in the seafood and wine of Palamós, you might want to consider a show cooking day tour to Palamos which includes a visit to the Museu de la Pesca, a seafood cooking demonstration, and a seafood meal with local DO Empordà wine. Palamós became an official village in 1279, but the history of human habitation in the area dates back to at least the 6th century BC. There are a number of historical buildings and sites to explore in the area from Iberian settlements to ruined castles to sites related to the cork and fishing industries. The town is also the birthplace of Frederic Pujulà i Vallès who was a pioneer of Esperanto literature and Catalan painter Ezequiel Torroella i Mató. Many celebrities have also stayed in Palamós. For instance, American writer Truman Capote spent three summers (1960 to 1962) in Palamós while writing his true crime classic In Cold Blood. Within the Old Town of Palamós you’ll find some of this town’s oldest buildings such as the Parròquia de Santa Maria del Mar and Augustinian convent remains. The former Capella del Carme holds art and cultural exhibits and currently has an exhibit about painter Ezequiel Torroella. The Sant Joan de Palamós neighborhood is another area of town worth exploring. San Joan was an independent neighboring town but was annexed into Palamós in 1942. The area still partly retains its own identity. 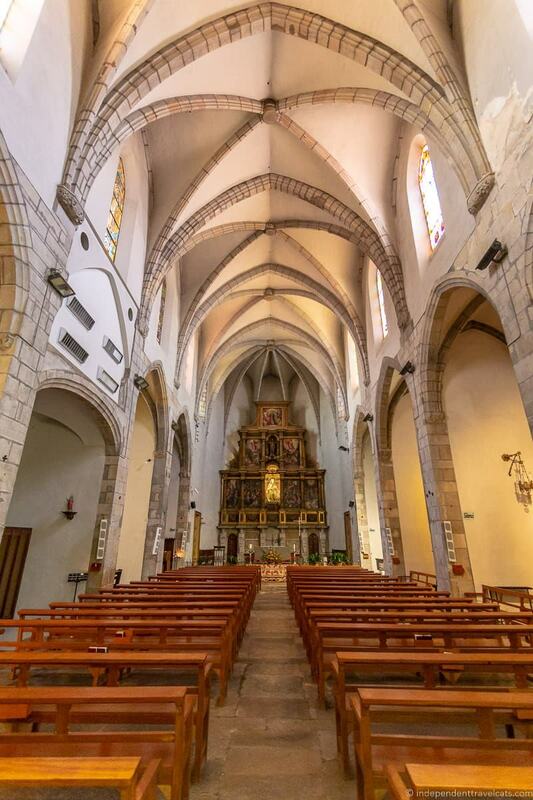 The Santa Eugenia de Vila-romà Church, also known as the Parròquia St. Joan, is a good place to start your exploration of Sant Joan de Palamós. Just outside of the Old Town is a 16th century stone cross called Creu del Portal which is situated at the entry to the Palamós Cemetery. This cross dates to 1593 and was originally located at the edge of the town in the Plaça dels Arbres. 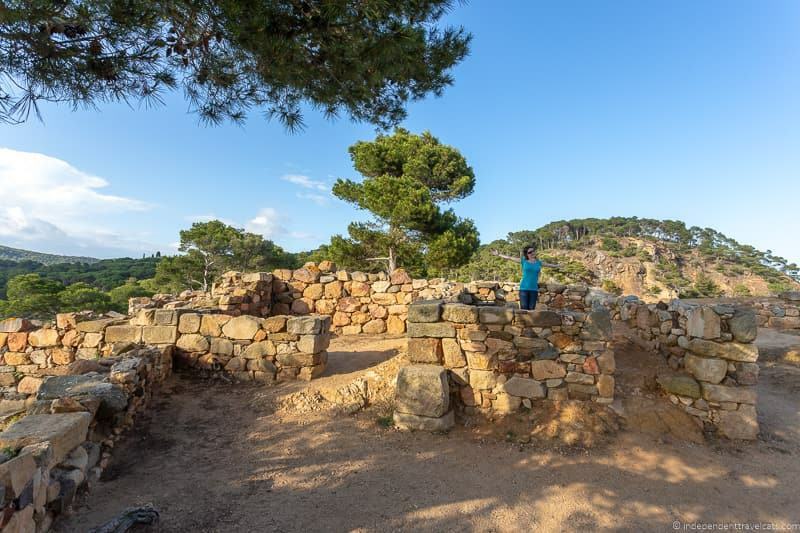 The remains of the Iberian settlement of Castell can be found on a hill next to Platja Castell on Sa Corbatera. This settlement is believed to date back to the 6th century B.C. It is free to visit. 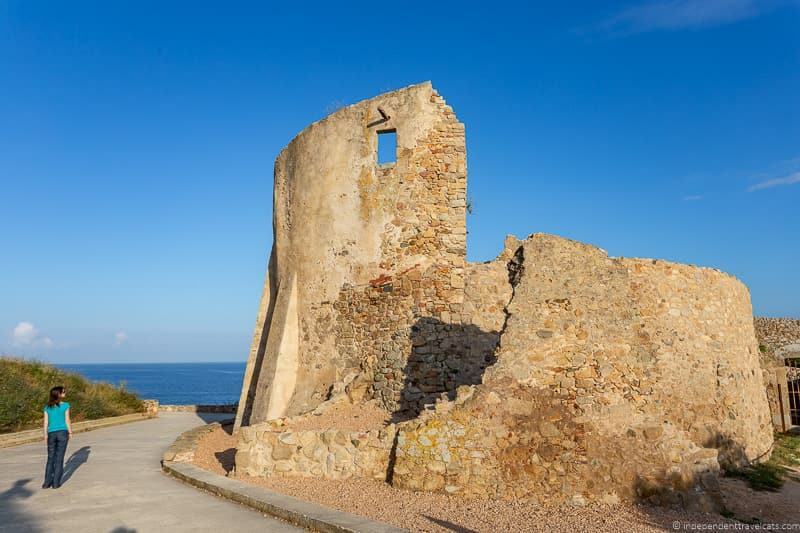 Castell de Sant Esteve de Mar is a ruined castle along the coastal path not far from Platja de la Fosca. The earliest parts of the castle are believed to date back to the 11th century and it sits on the site of a former Roman villa. It was lived in until the mid 20th century. The castle ruins can be seen from the path, but can only be visited with a guide. Contact the Museu de la Pesca or the Tourist Information Office to find out about arranging a guided visit. You’ll find a number of historical points of interest within the Bell-Lloc Vally in the Gavarres Mountains. These include the he castle of Vila-Romà, the sanctuary of Bell-Lloc church, old mills, and the Montagut dolmen. You can see all these sites along the Bell-Lloc Valley hike described within the Hiking Section. 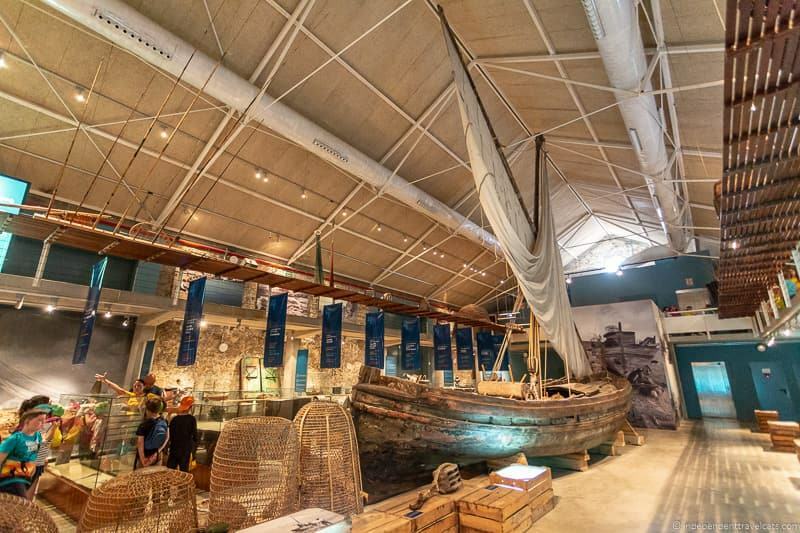 The Museu de la Pesca (The Fishing Museum) holds a number of fishing related artifacts and is the best place to learn about the town’s fishing heritage and culture. The Barraca d’en Dalí, or the barracks of Dalí, is a small stone hut that was built for the use of surrealist artist Salvador Dalí by his friend Alberto Puig Palau. Although it is unlikely that Dalí used it as an artist studio as intended, he did visit it at least once. You can find the little hut by following a forest path for about 10 minutes from Platja de Castell. 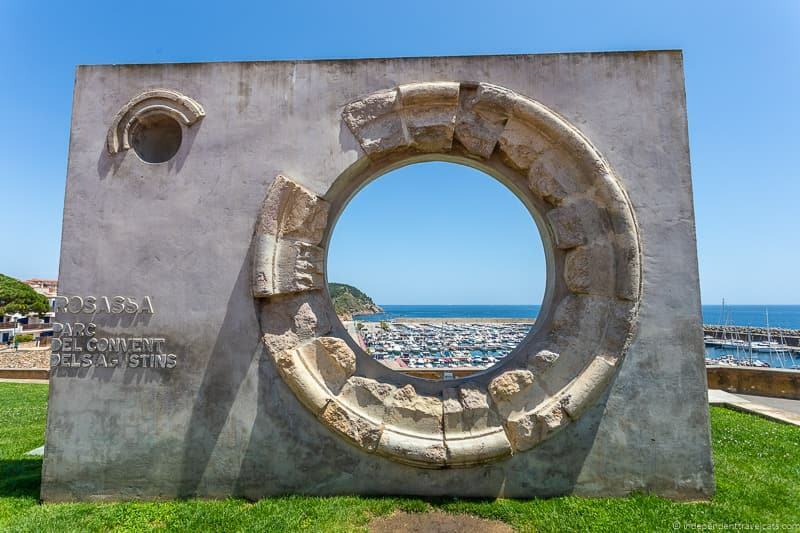 If you are a fan of Salvador Dali, we recommend checking out our guide to Salvador Dalí sites in Costa Brava. For those interested in learning more about the cork industry in Costa Brava, we recommend visiting the Museu del Suro (Cork Museum) in the nearby town of Palafrugell. 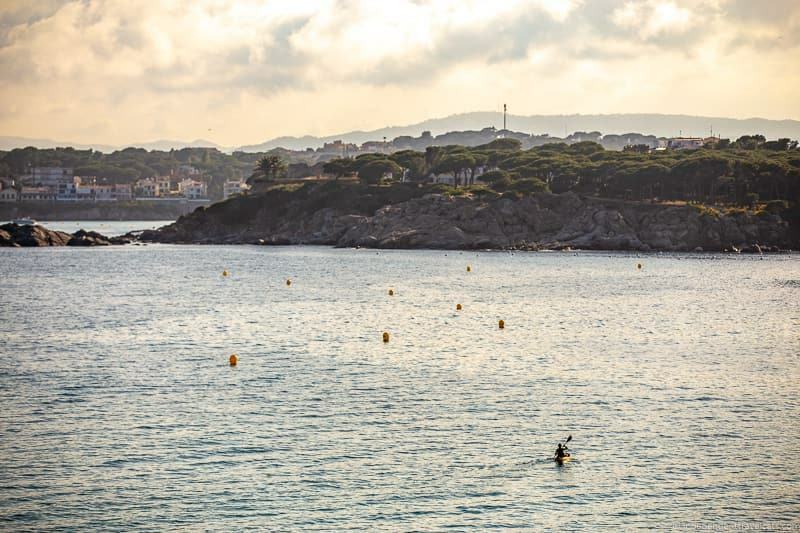 There are many great panoramic scenic views to find in and around Palamós, and on a nice day you can take in the views whether you are relaxing on the beach, following the hiking trails, floating around in a kayak, or exploring the Old Town. 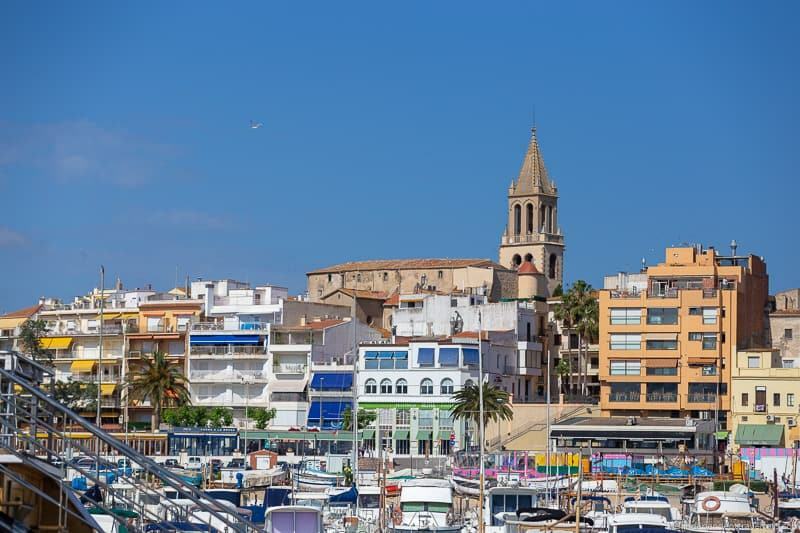 Some great places we recommend for scenic views in the Old Town include Plaça Murada (view of Platja Gran beach and harbor) and from the remains of the former Augustinian convent (over the marina). The lighthouse is a great place for views over the port and marina, especially around sunset. There are also many great views of the coastline and beaches to be found along the coastal hiking paths or from a boat. Montagut (mountain along the Vall de Bell-lloc hiking route) offers scenic views over the valley and Gavarres mountains. The Empordà region is becoming increasingly known for its wine. Wine has been grown in this area for hundreds of years and a variety of grapes are grown, producing red, wine, and rosé wines. A few wineries also produce cava, a sparkling wine. A speciality of the area is the Garnatxa de l’Empordà, a naturally sweet dessert wine. You don’t have to go far to taste the local wine and in Palamós you can enjoy a wine tasting at Finca Bell-lloc which produces both red and white wines. You can do a tour of the vineyards and winery and a tasting here by appointment. You can also try the local Empordà wines at many of the restaurants in Palamós or buy the wines at the local market. Wines from the region will have a prominent notation on the bottle’s label noting that they are DO Empordà wines (Empordà denominació d’origen). You can visit a number of other wineries in the Empordà region to sample the local wines and there is even a DO Empordà Wine Route that you can follow. Many of the wineries in the area are fairly small and require an advance appointment to visit so be sure to check ahead. 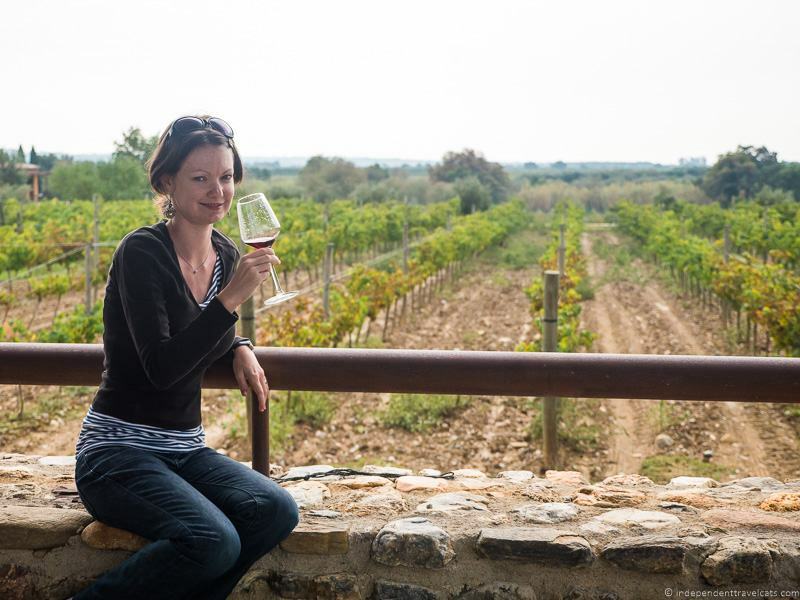 You can also take day trip to visit the Empordà wine region, such as this small group wine tour from Girona or this private wine tour from Barcelona which also stops at a botanical garden and the Dali Museum. You can see more tour options here. Wine trips are always better when someone else is driving! So that’s our travel guide on Palamós Spain! Have you visited Palamós or any of the other towns along the Costa Brava? If so, what were your favorite things to do in Palamós? As always, we’d love to hear your thoughts, and are happy to answer any questions you may have about visiting Palamós or traveling to anywhere in the Costa Brava area. We love hearing from you and you can drop any questions into the Comments section below. We will be arriving in Palamos on a Windstar ship. 4 of us are traveling together and we would love to know who to contact for hiking and or visiting wineries. If you are only doing one hike, I’d highly recommend the coastal hike as it is really beautiful and you can start it near the port. I’d take a look at this guided hiking tour that begins and ends in Palamós. It includes a few hours or hiking, beach stop, lunch with wine, and a transfer back to the port after you finish your hike. Depending on when it ends, you could also make time to visit the fishing museum and maybe the auction. If you are more interested in the Empordà wineries, there is this private tour of the region that you can customized based on the group preferences. It includes wine tasting, food, and some medieval villages. 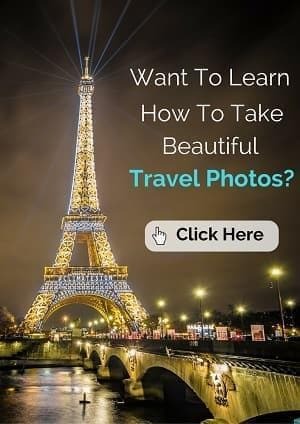 It normally starts and ends in Barcelona, but I am guessing they could customize your pick up location and drop off location with enough notice since it is a private tour. 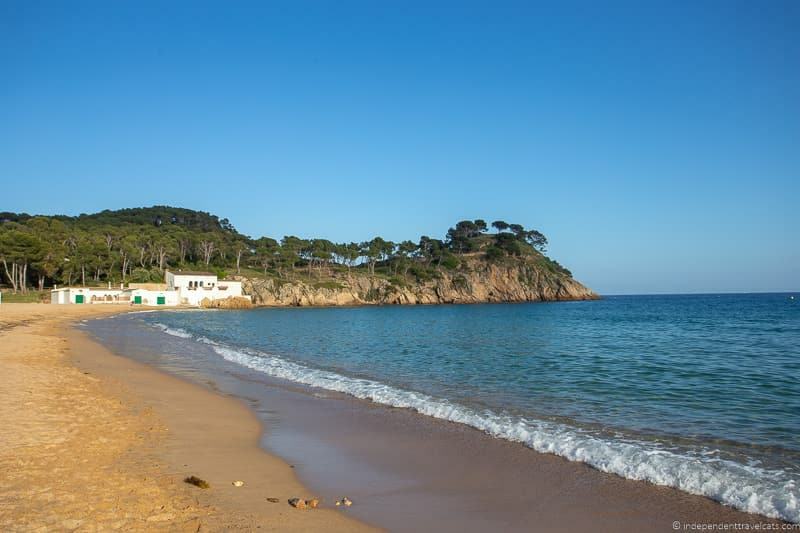 The beaches in Palamos look wonderful and you have listed so many interesting things to do on a visit here. We will definitely have to add Palamos to our Catalonia travel list now! I am going to have to go back to Spain. When we went last year, this is the part of the country we didn’t get to visit. My daughter would love to explore the hiking, and the views are just amazing. I’d be shopping the seafood and exploring the port. I think coastal living is so appealing. Look at how fresh that seafood is. Wow. Someday! Palamos looks like a beautiful fishing town! I’ve never heard of this one though along Costa Brava, which I wish I had known about before my first visit to Barcelona! Would have been nice to explore the coastal region and take in views like that and lay on some pretty beaches! Pinned for next time! We’ve been in Costa Brava some years ago for a TBEX meeting. If we knew how beautiful it was we would have planned to stay longer. We went as far as Tossa de Mar, but didn’t have time to go much further. I’m hoping to go back to Costa Brava someday and I’d love to visit Palamós too if we. Hi Anda, Tossa de Mar is a great town in Costa Brava as well, great beach and walled castle ruins! If you keep going along the coast (either direction really) there are so many other great places to visit! Next time I recommend starting in Blanes (the gateway to Costa Brava) and just keep heading east – so many great places to discover. If you enjoy hiking, the Camino de Ronda (or Camí de Ronda) is a great hiking route. I’ve been living in Catalunya for 4 years now, and I haven’t yet made it to Palamos… what a shame! It looks quite lovely, especially the beaches and seafood. I’ll definitely have to reserve a weekend to go up and explore it! Thanks for the travel inspiration. Wow! I’ve never heard of Palamos but there’s so many things to do. The architecture reminds me more of some the Italian coastal times rather than the Spanish influenced architecture I typically associate with Spain. The fishing museum looks really interesting – I love seeing how boats have evolved for different purposes. 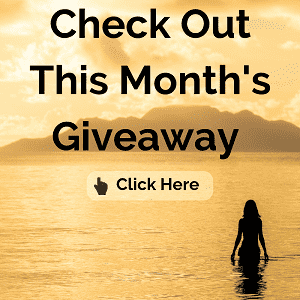 Wow looks like a great place for a summer break – so many great options for things to do. The beaches look gorgeous! I would also like to do a cooking workshop and some wine tastings. Nice that it is not too far from Barcelona. There is so much in the north of Spain I’m yet to explore. Palamós sounds fantastic, I love a destination that combines good walks with great beaches. Thanks for all the useful info, I’ll be filing this away for later! Glad I stumbled on your blog, nice work! I have visited Costa Brava towns nearby, but never this one! So thank you on the info! The hikes look like something I’d really enjoy.